Antique handmade French roof tile from the Pyrenees mountains in France is paired with an old zinc pitch pot creating a perfect small planter with old world charm. Available in a single with one pitch pot (pictured) or a double with two pitch pots on the same tile. Antique handmade French roof tile from the Pyrenees mountains in France is paired with an old zinc pitch pot creating a perfect small planter with old world charm. 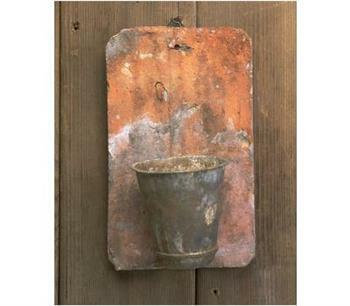 Hang it on your deck, fence or wall and dream of hidden treasures. Available in a single with one pitch pot (pictured) or a double with two pitch pots on the same tile. Approx. 9.5"H X 6"W.